During the day I spend lots of time working on my early learning printables website, Making Learning Fun. A lot of what I do involves graphics, drawing and arranging. As I work and as I quilt, I often listen to audio books. Recently I listened to the book, The Eighty-Dollar Champion: Snowman, the Horse That Inspired a Nation . I loved the book. I love rags to riches stories and this was a good one. I like animal stories. I like true stories. I like triumph over tragedy stories. I like family friendly stories. This book was all of that. This true story is about a Dutch immigrant Harry de Leyer. He comes to America with his wife Johanna to escape the aftermath of war torn Holland. The story is a nice mix of telling the story of the relationship between Harry and the old plow horse he saved from the slaughter truck, and of history of the time. It is great to hear a story of the American dream becoming reality for both the horse and for Harry despite the money, social status, and lack of fancy equipment, all obstacles which stood in their way. The horse, Snowy, was not a spectacular looking horse as far as show horses go…but he was full of love and commitment to the family that adopted him. Most show horses were high strung, pampered and anxious..not Snowy. After listening to the book, I did a google search to see if there were any pictures form the time…there were…I loved seeing them. I think these photos were included in the book but being I listened to an audio version I didn’t see them. 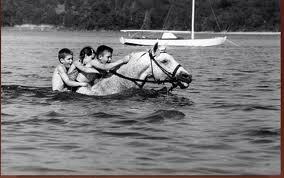 Here’s Snowy swimming with the de Leyer family…. and here’s Harry and Snowy. Fiction books are written every day. Authors can manipulate and make up anything they want to make the story be what they want…triumphant, heart warming, unbelievable… But non-fiction doesn’t always work way. Lots of things have to come together in real life, in real time, to make a non-fiction book tell an amazing story. This is a good book. I found myself purposely doing jobs that would keep me near the computer or my ipod so I could finish listening to the story. If you are an audio book, person, I’d add this book to you list.